New York Painting Services is a full service painting contractor that caters to commercial and residential property owners across New York and New Jersey. 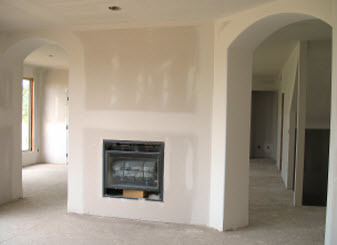 We are completely licensed and insured to provide our professional services and expertise at an affordable cost. Our artisans are among the elite specialists in the industry and have all necessary credentials and desirable attributes that make the final execution superior on all services we perform. 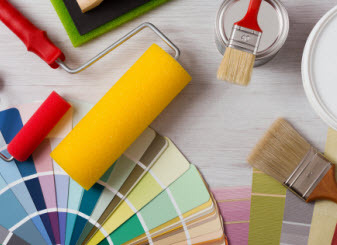 New York Painting Services specialists exclusively utilizes high-end products, materials, and equipment available to only licensed professionals to ensure maximum results. With New York Painting Services, our greatest asset is our customers and we strive to continually deliver friendly customer service, high morals, and traditional values with every service we conduct to make your experience with us extraordinary. New York Painting Services assists many commercial businesses and residential homes throughout New York and New Jersey acquire their desired interior design through painting and other fine services; among them is the Traditional Interior Design. Reflecting European décor, traditional interior design trademarks the deep wood tones, elegant furniture, and architectural details. With a wide range of versatility combined with traditional elements, you can easily create a unique look that reflects your tastes and personality traits. The lines on the furnishings, also known as silhouettes is one of the important facets to traditional style that reflect the 18th and 19th century curved lines, clawed footed tables, and wing-backed chairs for example. Common models of traditional furniture attribute Queen Anne or Chippendale styles. Antiques are frequently integrated, but replicas are just as acceptable. Though elegant, simplicity and comfort are traits belonging to traditional interior design. Creating symmetry by pairing accessories and furniture with common designs around the focal point; like the fireplace, large piece of furniture, or favorite art work are a part of the traditional interior design. Accents: In traditional interior design architectural embellishments are widely used that frequently include beveled wood paneling, elaborate moldings, intricate tile and wood floor patterns. Traditional design commonly used arches, columns, and built-in cabinetry to their advantage. 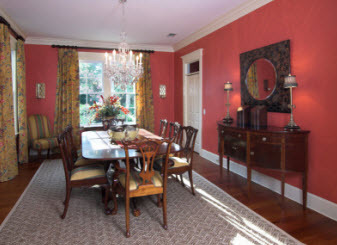 Paint Color: Traditional design favor walls that are painted in neutral colors to visually emphasize the elaborate furnishings. Most furniture in this type of room incorporates rich shades of colors like blue, red, and brown, while such colors may also be used for large upholstered pieces. In a traditionally designed room the artwork and accessories often incorporate more vibrant colors. Fabrics: Fabrics feature patterns such as floral, damasks, or paisleys, however they often come in solid colors as well and the textiles are the finer materials such as silk, velvet, or cashmere. Although e more affordable and easy to care for fabrics, such as cotton or linen are often incorporated. Wood: Another key element in traditional interior design is the rich tones when it comes to the use of wood. Dark woods like cherry, maple, and mahogany are typically used in furniture pieces of this style. Wood floors are a standard use for traditional styles; however, tile and an acceptable option for flooring. If you are looking to get your New York or New Jersey home or business in liking with traditional interior design, contact the specialists of New York Painting Services and let our expert discuss the options to accomplish your goals.